It's Apple-and-Cinnamon season again, and I for one am not complaining. Although my favourite apple-related recipe will always be my Mother's apple pie (a sentence no doubt spoken by millions of people every year), there are some things I can do with apples and cinnamon myself that I'm quite happy about. This particular recipe is of the lazy variety, or indeed "super-lazy" since the puff pastry is shop-bought. All my recipes for puff pastry dishes include the shop-bought product, because a) I'm really lazy like that and b) I actually can't make puff pastry from scratch, like, at all. I've tried. But if you can and want to make it yourself, go right ahead. Now, these are quite basic little pastries, and making them is incredibly easy, they just have one small trick to them: they're baked upside down. Normally, when people make puff pastries by the time-honoured method of "cut the pastry into rectangles and put some stuff in the middle," the pastry goes onto a baking sheet and stuff goes on top of the pastry. This means the pastry is weighed down by the "filling" and only rises around it - and puff pastry's whole point is the great way it rises. So, my Apple Pillows are done in a way that ensures the pastry can grow to its full potential, not held down by the apple. This is achieved by the simple method of putting them upside down in the oven. Start pre-heating the oven. Put the bakery paper onto a baking sheet. If you want, you can spread a thin coat of oil on it using the pastry brush. This will make the apple caramelise during baking. Peel the apple and cut it in flat-ish chunks of the size you want. I like small portions, so I cut the apple in four, and then cut off horizontal slices of the one-fourth, about 1cm thick. 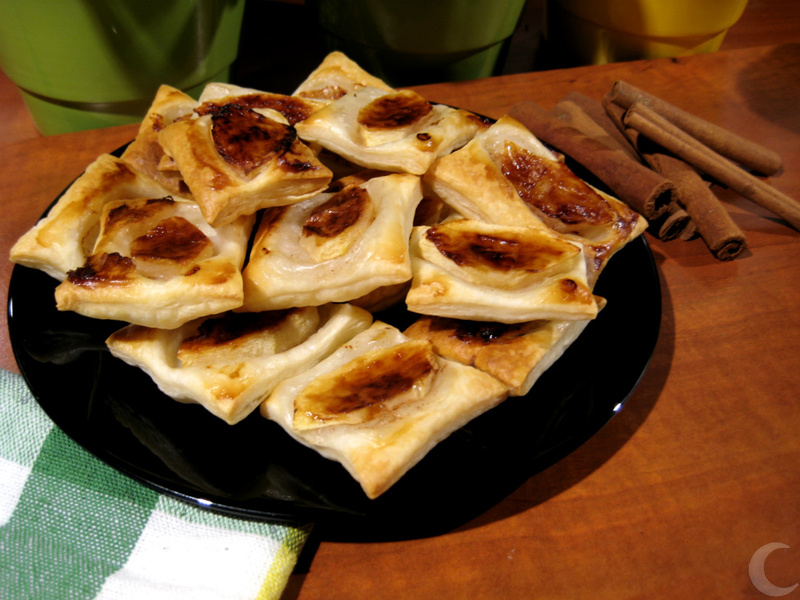 Cut square pieces of puff pastry, larger than the apple bits. Cover each apple bit with a square of pastry and lightly press down. Remember there still has to be some distance between the pastry squares. Put the baking sheet in the oven. Bake in 190 - 200 C for no longer than 20 minutes. Because the pastry is on top, you can't judge the whole thing by its colour. It may still be pale-ish on the upper side, while the apple and the lower side may be heading towards burnt. You have to gauge it by smell, or in a pinch lift one and peek underneath. If you don't want the "underside" (what you see during baking) to be pale, you can sprinkle it with water before baking. I don't to that, though, since I reverse them for serving anyway. It's best to lift them off the baking sheet with a spatula, making sure the apple stays with the pastry, since it didn't sink into it during baking.